Conscious of the need to avert global biodiversity loss, on May 3, 2011, the European Commission adopted a new strategy to halt the loss of biodiversity, known as EU Biodiversity Strategy to 2020 (EUBS). This was a response to two important strong political mandates adopted by the 27 European heads of state in March 2010. Furthermore, such a biodiversity strategy is in line with international commitments adopted by 193 countries (including EU member states in the conference of the parties to the Convention on Biological Diversity in Nagoya, Japan in 2010). Malta is a party to both. The EU is obliged to establish its own biodiversity policy in line with these international commitments, improving the state of Europe’s species, natural habitats and ecosystems, aware of the services biodiversity provides. The immense value of ecosystem services and the urgent need to maintain and restore these for the benefit of both nature and society are highlighted. Biodiversity is the variety of life on the planet, essential for our economy and for our well-being. It is about maintaining nature’s capacity to deliver the goods and services that we all need, and whose loss comes at a high price. Life on this planet – we call home – depends completely on biodiversity, a natural capital to be managed sustainably for the benefit of future generations. The EU Commission co-financed a study on ‘The Economics of Ecosystems and Biodiversity’. Findings include: the cost of biodiversity loss due to the current over-exploitation of global fisheries estimated at $50 billion; global business opportunities from investing in biodiversity could be worth up to $6 trillion by 2050; the €15 billion a year estimated economic value of insect pollination within the EU. If one does not understand the economic and social value of ecosystem services and the need to restore them for the benefit of the economy, one can never honour the principles outlined in the EUBS. The economic benefits of biodiversity is not just protecting species and their habitats for their own sake. It is not ħaxix ħażin (unwanted good-for-nothing vegetation) as unfortunately some Maltese politicians believe, or are made to believe. For the effective implementation of the EBUS, the main policies need to be integrated to sectoral policies and be taken into account in wider policy concerns, something the Planning Authority is adamantly refusing to accept. To combat invasive alien species including through preventing the establishment of these species and through control and eradication. Such a concept has not yet been conceived by some local politicians; and to step up its contribution to combating global biodiversity loss. There are separate ministries responsible, directly or indirectly, to combat global biodiversity loss. But how are these contributing to such obligations? Official ‘landscaping’ with Invasive Alien Species. Millions are budgeted per annum and used substantially, to import alien invasive species, some serving as carriers for other alien species and diseases; spray herbicide and pesticides on indigenous wild species, uproot indigenous mature trees and bulldoze other indigenous vegetation. Other funds pay official entities to ‘clean’ vegetation, from country lanes and rural areas. These funds are literally a waste of resources, when biodiversity is crying out loud to be managed, monitored, legally protected and discerned to honour such EBUS obligations. Besides, the Public Authority involved in ‘planning’ regards biodiversity as the main enemy of the State, to be exploited to the fullest as long as commercial considerations are met. Government projects with a ‘ħaxix ħażin’ mentality, subsidised with EU funds, completely ignoring EBUS targets. 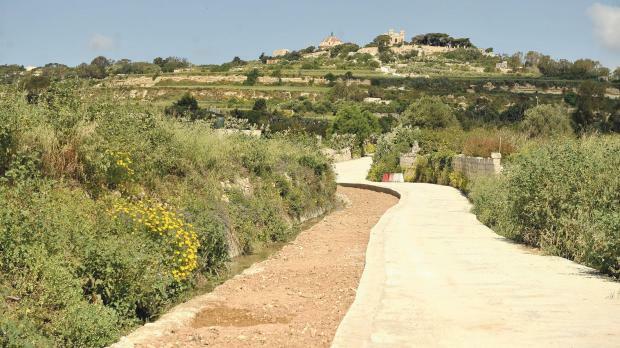 Since the inception of the EUBS, two outstanding official government projects stand out: a quality garden of excellence at the Mdina Ditch; and the present widening of valley paths to ‘highways’ in Malta and Gozo. The cherry on the cake is that these are subsidised by EU funds. And none of the EBUS targets and activities outlined in the EUBS are taken in consideration, but all managed and executed with a ħaxix ħażin mentality. These two projects, besides others, cannot but show the complete resistance and ignorance of the concept that biodiversity loss is one of the main environmental challenges facing the planet (if we regard ourselves as forming part of the planet), despite the ‘economic value of ecosystem services and the need to restore them for the benefit of the economy’. And if this is not enough, some politician/s, tongue in cheek claim, that Malta is the best in the EU. Would be a perfect statement if intended to mean that nobody ignores the obligations of EUBS as we do. Maltese flora is mostly unappreciated, overlooked, senselessly butchered, and exploited. Considering the smallness of the Maltese islands, compared to the United Kingdom, Malta has more different species per square kilometer than the UK has. Such is the richness of our country. It is left to individuals or environmental NGOs to take the lead in scientific studies, fieldwork, publications whether scientific, popular or educational, and public awareness. Official entities are more interested in paper talks, drafting guidelines without any legal powers, or publishing regulations, hardly, if ever enforced. One of the natural fields in this biodiversity richness with which the Maltese Islands have been gifted is Orchidaceae – the family of orchids. Scientific data on indigenous orchids was scattered. Such data was mainly available to botanists dedicated to scientific research. This data was not easily available in a popular way to many educators. As with many other wild species of flora and fauna, popular interest lacking scientific background, usually leads to a negative way of appreciating such a delicate, priceless richness – through collection. Without any doubt, a breath of fresh air in this field, is the new 232-page book, Orchids of the Maltese Islands – a descriptive guide, by Stephen Mifsud. The initial efforts came from Green House Malta and BINCO. The former is a non-profit eNGO with its major aims to conserve through ongoing monitoring schemes of threatened flora and fauna with the help of citizen scientists. Biodiversity Inventory for Conservation (BINCO) is an international non-profit organisation with a passion for nature and a desire to help preserve the remaining natural resources on this planet. The Ministry for the Environment, Sustainable Development and Climate Change; EcoGozo within the Ministry for Gozo; the Environment and Resources Authority (ERA) co-sponsored the publication. Stephen Mifsud, though relatively young, is definitely on the way to becoming one of the leading botanist on these islands. With years of dedication, field work, an eye for detail, a vast experience in macro-photography, especially in the study of wild flora, he could not have been a better choice to author this book. The past difficulties he found in his studies without doubt gave him more drive and experience for such work. This first comprehensive book on the subject, introduces the biology of orchids, systematic and classification. The book goes in great detail about orchids in general and deeper on indigenous orchids. The main part of the book is taken up by orchid species profiles – 36 indigenous species of orchids, grouped in 7 genera. It goes in details with regards to recorded species. The present names of the species together with any related synonyms, including the etymology of the botanical name. The habitat, frequency, and local and global distribution, detailed morphological description, species variability, closely related species, taxonomic notes and problems, history accounts in Malta, observed pollinators and a useful quick identification note are also discussed. The status of each species is given: very rare, rare, scarce, frequent, locally frequent in restricted areas, or common. The book is lavishly illustrated with 300 professional scientific photos the majority of which are taken by the author himself. Line drawing are also included where it was found necessary to illustrate details of parts of the species. A distribution map for every local species is also included. The distribution maps are compiled from data available from the mid-19th century to date of publication. Wisely enough, the rare species are not accompanied by a distribution map, to protect them from avid orchid collectors, both locals and foreigners. A classification table of each species, its description, and morphological, availability, reference to closely related species, flowering period are also given. These are also accompanied by a quick identification help. It also explains that there are 20 species which are either misidentified or extinct because of the above given reasons. A reference list shows the extensive research conducted. Two appendices further contribute to the great wealth of the book. Appendix I relates to orchids occurring in Sicily. and orchid protection provided by ERA. These are followed by a glossary, index, and short notes on Green House, BINCO, and on the author. Another great contribution of this book is the standardisation of Maltese names for wild natural species, in this case orchids, given in Appendix II. This comprehensive reference on indigenous orchids is not only a much needed updated scientific platform for locals and other foreign botanists, but also for orchid enthusiasts, as well as for educators, planners, as well as those passionate about Maltese natural history. One also hopes that such a publication will catch the attention of politicians to help them realise the biodiversity richness of our Country, and the destruction for which they are responsible by their decisions, taken without any thought for the safeguarding of our national and international heritage. It is also another tool to help create a stronger public awareness which can be a deciding factor in the harnessing and controlling the continuous destruction of natural areas resulting in the ever bleaker outlook, not only for dwindling orchid population, but also for all Maltese biodiversity.